Middlesbrough manager Aitor Karanka says he has no hesitation in giving opportunities to young players such as Luke Williams and Ben Gibson. Williams, 20, has featured in the last three games while Gibson, 21, has missed just one of the last 13. The bench for the win against Derby featured Mark Kitching, 18, David Atkinson, 20, and Curtis Main, 21. "It doesn't matter about the age, we are playing a lot of young players," Karanka told BBC Tees. Karanka has started Williams in his last two games, wins against Brighton and Derby, since he was recalled from a successful loan spell at Hartlepool in February. 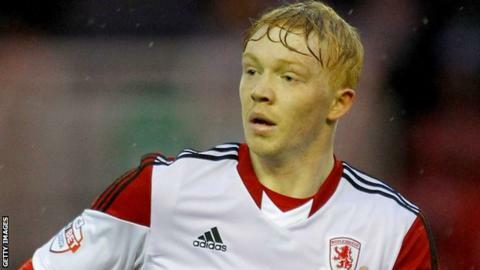 "Luke is young, he has quality and personality and I'm very happy with him and his performance," Karanka said.